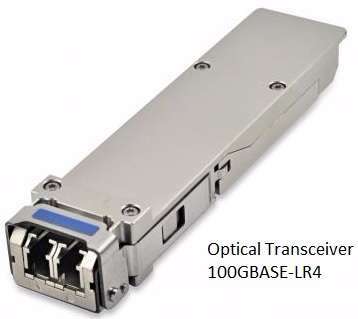 This page explains basics of optical transceiver.It covers function of optical transceiver used in fiber optical network. The term Transceiver refers to any device which houses both the transmitter and receiver functionalities in single package. The device which transmits and receives RF signal is known as RF Transceiver. Refer RF Tranceiver➤ for more information. Similarly the device which transmits and receives optical signal is known as Optical Transceiver. Both the end of fiber optic network will have one transceiver to complete the chain. This is because each optical transceiver composed of one transmitter and one receiver part. • It supports about 100 Gbps of bit rate. • It has power dissipation of less than 5 Watt. • Used for 100 Gigabit ethernet interfaces over single mode fiber cable. • Supports maximum length of about 10 Km over single mode fiber (i.e. SMF). • It has 4 x 25 G electrical interfaces. • Supports 4 x 25Gbps LAN-WDM Transmitter.